Guideline 2: other books describe the radial part of the hand to represents the (more) active mind. Now, which of these guidelines is more accurate? And is it possible to combine both guidelines? To answer these questions, I think it is necessary to be aware that the principles 'active' and 'passive' can only be understood in the perspective of the Chinese Taoistic philosophy (Yin-Yang) and/or the Indian Vedic philosophy (Ida-Pingala). 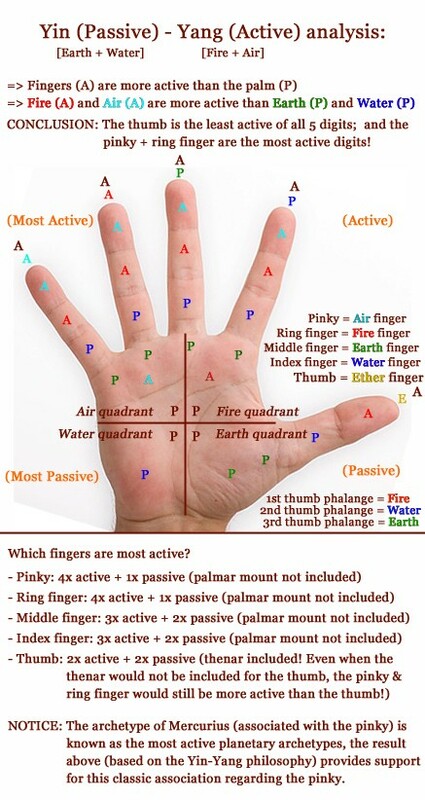 Based on the principles used in Elemental Chirology I have created a map describing how the principle 'active' and 'passive' get distributed through the hand according the palmar zones (where each palmar quadrant gets associated with one of the 4 elements, each finger gets associated with one of the 4 elements, and each phalange of the 5 digits gets associated with one of the 4 elements). An interesting aspect of the chart is that it provides some (philosophic) support regarding the classic association for the pinky finger with the archetype of Mercurius (which is refering to the planet Mercury), which is known as most active of all planetary archetypes (by the way, this is also true for the physical characteristics of the planet Mercury: which is known to have the highest speed in our solar system featured with very high temperature changes). Question 1: which of these guidelines is more accurate? Question 2: is it possible to combine both guidelines? ANSWER 1: The chart present plenty of support for guideline 1. 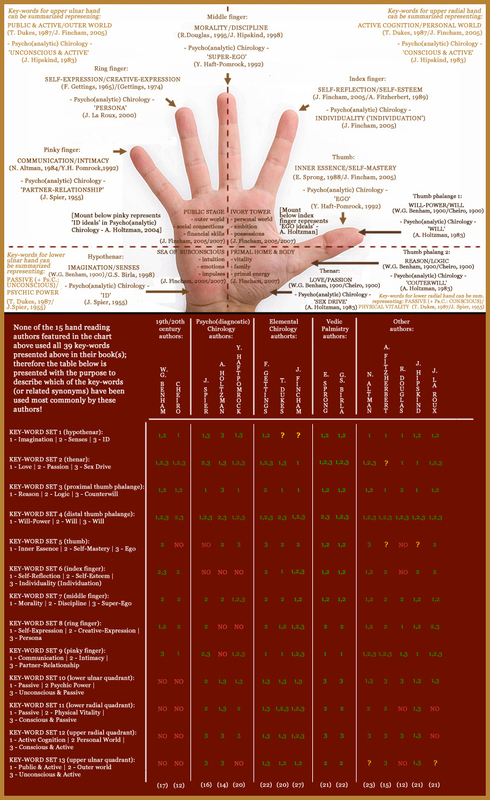 But surprizingly the chart presents hardly any support for guideline 2 (only when the full thumb gets associated with the lower radial palmar quadrant then one could find a bit of support for that; however, regarding the 4 distal digits there is actually contradictive evidence regarding guideline 2). ANSWER 2: The chart suggest that a quadrantial approach regarding the principles 'active' and 'passive' is very well possible; however guideline 2 appears not helpfull at all for that purpose. 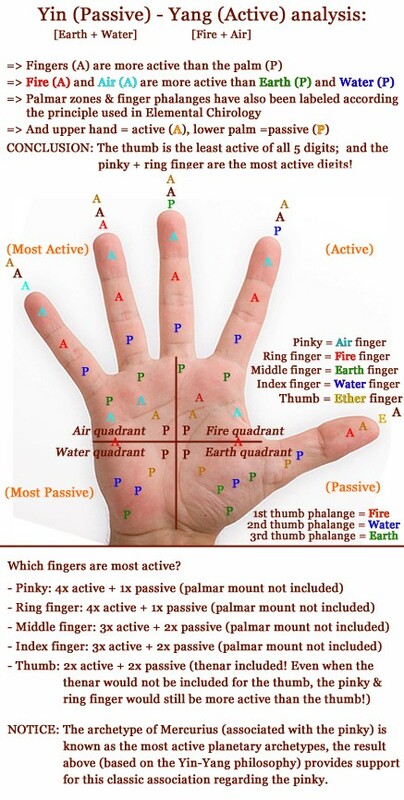 Therefore one can better avoid using guideline 2, but one try to become more aware of the various dynamics between the 4 quadrants of the hand. The lower ulnar quadrant is clearly the most passive quadrant... however, the upper ulnar quadrant is clearly the most active quadrant! The thumb represents the inner essence of man! "The thumb represents the least active digit"
This statement makes no sense to me. We all know that functionally the thumb is the MOST active digit, the one we use most and need most for our hand to function well. Lynn wrote: "The thumb represents the least active digit"
Me neither. When I read first read that statement, I tested it out around me. I tried to braid my hair and not use my thumbs. I could do it, but in a messy way. Try picking up a straight pin without thumbs or using it functionally. The relationship between the index finger and the thumb are very important and interactive and probably should be considered as a working unit. Does the thumb really represent the MOST active dgit? What makes you think that the thumb is the most active digit? PS. Lynn, so far I was not talking about hand motorics at all... I was talking about 'active vs passive' in the perspective of the Yin-Yang philosophy! 2 - The index finger is more commonly featured in body language saying 'I' or 'me'. 7 - And regarding the prehension grip, this nearly always gets both the thumb + index finger involved. Sure Patti, the thumb and index finger often work as 'working unit'; the 'precision grip' is a good example of this. By the way, the fine motorics, dexterity & sentitivity is more advanced developed for the index finger than for the thumb - which explains that why the index finger plays a (slightly) more significant role in touch, and the potential to use the thumb for fast motoric tasks is probably smaller than seen in any of the other fingers (and highest for the index finger). Lynn, so far I was not talking about hand motorics at all... I was talking about 'active vs passive' in the perspective of the Yin-Yang philosophy! But what use is the philosophy without practical application? Principle vs manifestation again. The thumb is NOT the most passive digit! Maybe I was wrong about thumb being most used (?) but it is certainly most needed & most important digit on the hand. "Functionally, the thumb is the most important digit. Because of its relation with the other digits, its mobility, and the force it can bring to bear, its loss can affect hand function greatly. The index finger is the second most important digit because of its musculature, its strength and its interaction with the thumb. ...... In terms of functional impairment the loss of thumb function affects about 40-50% of hand function, the loss of index finger function affects about 20% of hand function, the middle finger about 20%, the ring finger about 10% and the little finger about 10%." Oh yes Lynn, no doubt that we agree that it is the most important digit. But actually, I don't think that there was any disagreement regarding this at all! Anyway, my short summary indicates that the index finger is from many perspectives recognized as the most 'active' digit from a motoric point of view. However, after saying this... I have to point out that in the Elemental Perspective we can see that the index finger is connected with the element 'water' and gets associated with the PASSIVE Yin! Hmmm, this is very interesting... because I think this example actually perfectly illustrates the DANGER regarding when one starts mixing the Elemental perspective with other perspectives that do not relate to the Yin-Yang philosphy at all! Guideline 2: other books describe the distal part of the hand to represents the active mind. You have accidentally swopped the guidelines round. You said that you have compiled the chart with regard to Elemental Chirology, which suggests Dukes, Fincham, Hirsch & Jones as your sources ? I am quite puzzled by what you are doing here. You have taken some of the rulerships of some parts of the hand, completely ignored other factors, added fingers onto quadrants, added thenar mount but not the other mounts, and done some maths that actually doesn't prove or demonstrate anything. Nowhere in elemental chirology would you 'add up' the elements in the way you have done. OK so you are not talking about motorics, you said I was talking about 'active vs passive' in the perspective of the Yin-Yang philosophy!. and you are applying this philosophy to a hand and trying to draw conclusions from it, but you have not done it in the same way that elemental chirology applies it. You've taken selected parts of a very complex system, and placed it on a 2 dimensional hand. Regarding which finger/quadrant is the most active in an individual you would have to analyse the live 3 dimensional hand. For example, whilst water quadrant is in the most passive subconscious area of the hand, if it is the largest quadrant it would be the most active one in that person's consciousness . But it's not surprising is it, because you have been selective in your construction of the chart, and omitted factors that show the radial side to be active. why? because it suits you to take on board some parts of elemental chirology but not others? or because you don't understand how it is possible to combine both guidelines? Why do you exactly think that I have been using a 'selective' approach? And what factors do you think that I have omitted? And can you please tell me... what makes you think that the radial side of the hand is more active? By the way, I see that you wonder regarding 'why' I arrived at my 2nd conclusion; but haven't you noticed that I have substantiated this with the fact that there are slightly more A-s than P-s visible at the ulnar side of my picture (), while at the radial side there are slightly more P-s than A-s. Yes of course ulna = passive and radial = active is included in elemental chirology. You knew this early in the thumb discussion. Do you want me to find quotes? Thanks for pointing out, I have corrected the colors of the 2 upper palmar quadrants. I said "You did not label eg air quadrant as passive or earth quadrant as active." wait a minute! P 48 Dukes quadrant analysis doesn't make sense. He's divided the hand as radial =conscious and ulna= subconscious, upper palm = active, lower palm = passive. But he's labelled the quadrants as if he has divided the hand like this: radial = active, ulna = passive, upper palm= conscious, lower palm = subconscious. I'll have to check this elsewhere. I haven't done quadrants for 13 years so can't remember which way round we did it! Lynn, I hope you can understand that early in the other discussion I was not aware of many things regarding the elemental system (so, I might have said a few things that I would now no longer support). But now that I am aware of the principles described by Dukes and others... I don't think that the radial side of the palm is in Elemental Chirology associated with 'active', nor the ulnar side with 'passive'. I have checked the works of Dukes, Jones, Fincham & Hirsch but none of them appear to use that principle - probably because the Yin-Yang philosophy does not provide a basis to use that principle! Now, if you think that I have missed anywhere that one of the 4 authors does use your ulnar (passive) vs. radial principle... you are welcome to guide me to the specific passage in their work - yes, a quote or page number would be very helpful! By the way, in Dukes work (p.47) the upper hand (= upper palmar quadrants + fingers) is associated with active cognition and the lower palm (= lower palmar quadrants) is associated with passive cognition. Now, I had not yet included that principle in my picture... but this was not a conscious choice; I could include Dukes' principle as well in my picture but it does not change anything regarding the ulnar versus the radial side of the hand! Anyway, in the picture below I have also included Dukes' principle + the 4 the horizontal palmar elemental zones as described in his book on page 60. Conclusion: the thumb is still the least 'active' of all 5 digits! Lynn wrote: I said "You did not label eg air quadrant as passive or earth quadrant as active." Which is the traditional way - just a switching around of the terms active/passive and conscious/subconscious. Still keeping the active energy on the fingers and on the thumb side, and the passive on the bottom of the hand and ulnar side. Nothing new here. In case my previous msg was garbled because I wrote it quickly when I noticed Dukes mistake.... hope this explains better what I was saying. When I said "You knew it earlier in this discussion" I was referring to when we first spoke about quadrants on pages 2 - 3 of this discussion. The air quadrant is conscious and passive"
If the quadrants were labelled according to the above list, then the radial side of the hand is active, ulna is passive, top of palm is conscious.and lower palm subconscious. But on P47 he draws the diagrams the other way round!! I will find where he says active for radial. Yes the palm can be divided either way, keeping the active energy on fingers & thumb side and passive on the wrist & ulna. But during the course of these thumb discussions I hadn't noticed the discrepancy between Dukes P47 & P48. (4) The water quadrant is unconscious and passive"
NOTICE: When looking at the 4 numbers in his picture above this quote then we can see that EARTH = 2 and AIR = 3... so in the passage quoted above he probably made a mistake by swapping both words; where 'air' is written he should have written 'earth', and where 'earth' is written he should have written 'air'. Because if his summary is correct that would implicate that his principles describe on page 47 are ALL incorrect... and this quite unlikely. Maybe his mistake was confusing between the new system he was developing and what he was copying from Gettings. Lynn wrote: In case my previous msg was garbled because I wrote it quickly when I noticed Dukes mistake.... hope this explains better what I was saying. The air earth quadrant is conscious and passive"
Yes Lynn, your quadrant descriptions represent the principles described by Dukes featured with the four pictures on page 47 and 48. Dukes has made a mistake in his summary below the pictures on page 48; in my previous post I have described the details... and I have corrected Dukes' words in the quote above. - and in the 3rd sentence he used the order: fire - air - earth - water. So, in his summary he used the order for the elements used in the 3rd sentence... but he attached the principles in the order of the 2nd sentence! It's just his summary on page 48; the principles featured with the pictures on page 48 appear all correct. He labels it as right hand - R.
He's listed the order as water, earth, air, fire which is correct if it is a LEFT hand! Yes, that could be described as a small inconsistency in the perspective of the other 3 'hand' picture examples on page 47 and 48... though formally one could also say that the letter R only serves as an example and does not lead to any problems regarding how the apply the principles. Anyway, well spotted again Lynn!